Looking for a driver that is suitable for one CR123 lithium primary or two AAs. Like a Solarforce 0.8-4.2V but with moon mode (the Solarforce D/I 2.8-9V 4-mode on low is perfect for the purpose). Searching the interwebs, I really don’t think there is one, so is there anyone that can build one? The issue is that you will need a boost driver for this and there are not any good open source boost options on the market. The pre-made options generally focus more on having 3 strobe modes then a nice moon mode and overall good mode spacing. It would work with a 16340 due to it having a voltage of ~3.7V. With a CR123 though the cell only has a voltage of 3V and drops quickly. This means that it would only be able to produce around ~100-300 lumens max on a full cell and it would drop very quickly. 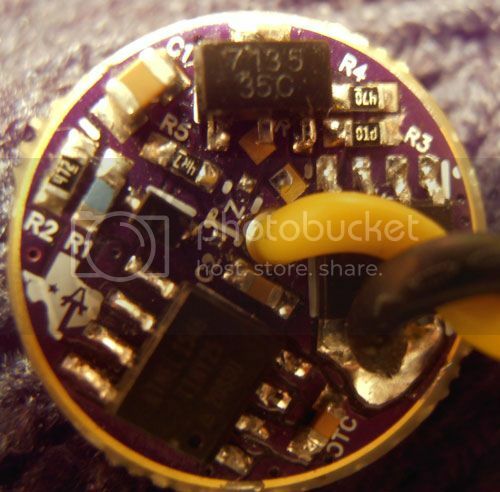 In order for it to allow full power to the LED it needs a boost driver to raise the voltage up to what the LED needs of around 3.1-3.5V depending on how much current you are running. So if he really wants quality stuff I really think the best option would be to buy quality 16340 cells (that will also save his budget) in combination with your(our)Texas Avanger 17mm driver. This is for a military application, so rechargeables is a “no go” and primarily the lights will run at low, I’d even opt for a single mode. The purpose is low-light map reading and the LED(s) is a 495nm XP-E.
Harleyquins nanjg102 Attiny boost driver would do it but only DIY. You need to find someone to build and flash it for you. A single mode boost driver is much simpler and could be done fairly easy. In fact many off the shelf single mode boost drivers would work by adjusting the sense resistor to lower the output to where you want it. I have two drivers that I’ll sandwich to evaluate if the output is ok (compared to a LRI Freedom NV green). If you post a picture of the drivers we can possibly help you figure out which component is the sense resistor and give you an idea of what changes to make. Thanks, but I think the efficiency in that construction will be lousy, and if it’s possible to build/configure a specified driver , that would be the best. 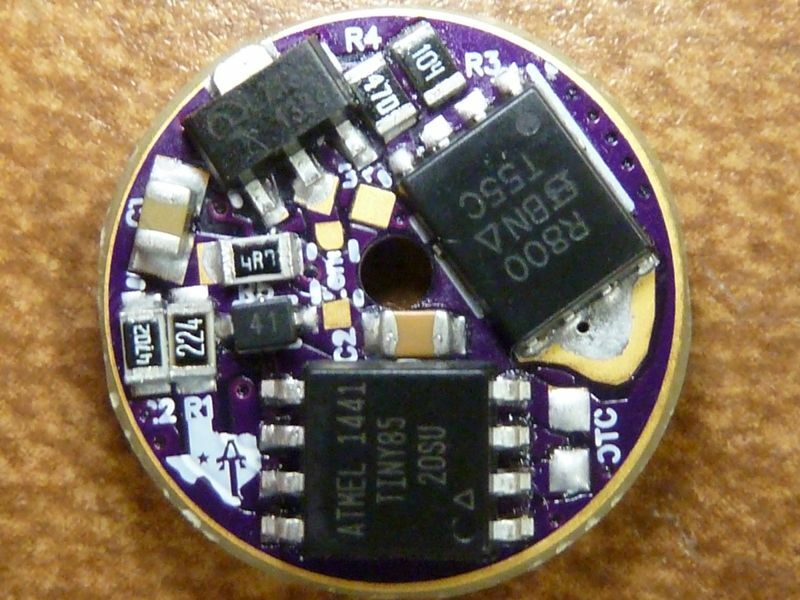 I’m putting together a 0.8-4.2V single mode driver with a 4.2V 3-mode driver with moon-10%-50%. Well the change to the sense resistor would not effect the efficiency, just lower the current to the LED. So it would depend on what you used for the base driver. You can design a boost driver from scratch as well naturally, just a lot of work. Do you think (after deciding/checking the current to the LED) there is a possibility in building a reasonably efficient driver? I mean, anything above, say 80%, would be acceptable. I bet there are pre-made drivers that can reach that level of efficiency. Although at the tiny currents you will be running for moonlight mode efficiency really doesn’t matter. The difference between 50% and 100% efficiency is only going to be like 3ma. Moon mode is generally on the order of ~5ma of current. The key is finding a single mode boost driver (or really any driver will work if the mode spacing is what you want) and then simply adjusting the output down to what you desire. What size driver are you looking for? The lights are based on the short Convoy S2+, so 17mm. I’ll take a look there, thanks.